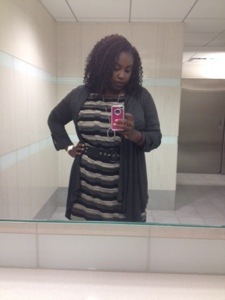 Fabu Fashion Thursday (aka Quick Bathroom Selfies) – This Square Peg. Because I thought today was Thursday, I decided to use my brain freeze (seriously, I believed it was Friday with all my heart) to my blogging advantage. New feature: every Thursday, I’ll post pics of what I’m wearing. Viva brain freeze fashion! I do it for you, don’t you know? 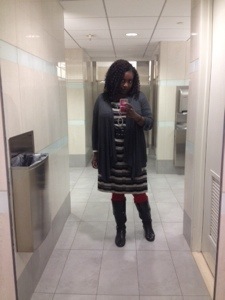 Dress is a cute sweater dress I found at Dress Barn. DB tends to sometimes skew to the more mature lady, but with diligence, you can find snazzy, age-appropriate garb. Light gray sweater is from Ross. Speaking of diligence, it takes a lot of that to find neat things at Ross. But you can do it, if you try. Red tights are from Wal-Mart. It’s my least favorite place in the world, Wally World, but those tights had me seeing red, in a good way. 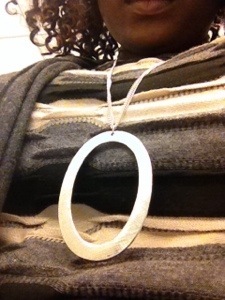 Silver necklace from Target, I think. 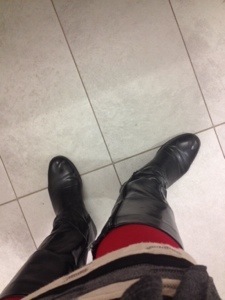 And your standard black, I’ve-owned-them-for-so-long winter boots. Fancy, huh? What are you wearing today? Next Post What ‘tude? Gratitude.